It used to be said that data runs the world. They were wrong! Data drives insights and insights are what matter. However, getting to these insights is hard, time-consuming and expensive. So much so that companies are turning to trusted hardware vendors to find the right tools and solutions to accomplish this very fundamental task. But figuring out which tools you need to uncover those hidden gems can be a challenge. What do most customers do to evaluate the right platform for their projects? They look to industry-standard benchmarks for guidance. One such benchmark, TPCx-HS, provides guidance related to big data analytics by stressing both hardware and software stacks, including the execution engine (MapReduce or Apache Spark™) and Hadoop® Filesystem API compatible layers. It provides a vendor-neutral evaluation of both a product’s performance and price-performance ratio, thus helping customers make the right choice for their large cluster, data analysis projects. 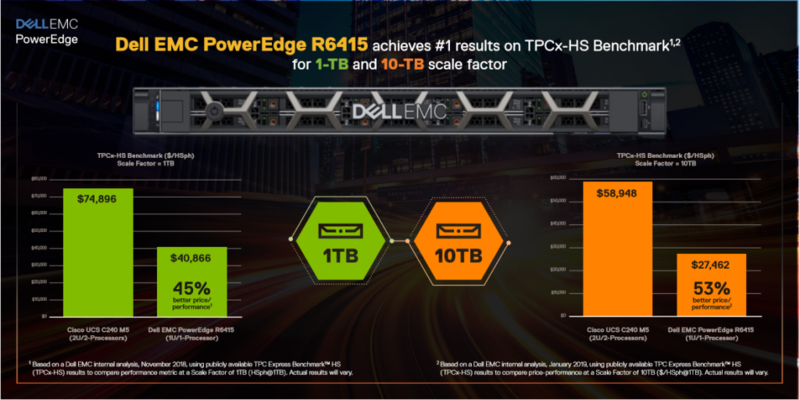 The Dell EMC PowerEdge R6415 is a single-socket dense server that offers the right feature set for data analysis, as evidenced by its test results in the TPCx-HS benchmark. The results speak for themselves. The single-socket PowerEdge R6415 is a great solution for Apache Hadoop®-based, big data environments without unnecessary and extra costs. Similarly, this cost-effective server is also ideal for virtualization, scale-out and software-defined storage, bringing high-density computing to the data center. Dell EMC servers help you prepare for innovation in your business and can help you solve your IT challenges. Learn how to turn data into insights. Follow @DellEMCServers and visit dellemc.com/servers to get started. *Based on Dell Internal Analyses versus comparable Dell EMC PowerEdge R630 configuration.